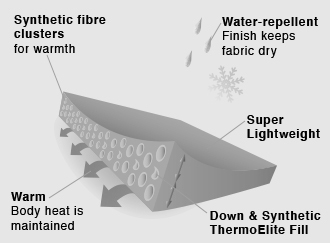 An inspired fill blend that offers the best of both worlds, combining the natural insulating properties of pure down with our new ThermoElite synthetic fibre clusters for outstanding super lightweight core insulation in all weathers. This fill-fusion delivers warmth even after a downpour. Amazingly light and compressible, it’s the perfect trail packable. Designed to keep you warm when the temperatures plummet, our ThermoElite Hybrid technology will keep you dry with its natural water repellent features, and its lightweight properties make it a must-have for any adventures on and off the trail.